Arrange wine corks from memorable nights and travels to create a unique decor piece. Whether you sipped Sangiovese in a Tuscan village or shared a knockout Chardonnay around the corner, there are some wine bottle corks that deserve to become keepsakes. 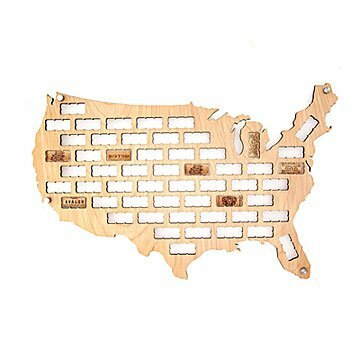 This country-shaped design lets you arrange these little mementos to create a unique decor piece. Give one to the host whose motto is, "Will travel for wine." Crafted from Baltic birch plywood in Tampa. All items are 1/4" in thickness. See below for measurements by country. It was a bit thinner than expected, and it only came with 4 wall pegs (needed 6), but they are sending us more ASAP. It's a nice piece and I'm excited about hanging it and filling with corks. I ordered the Italy map which shows and came with the island if Sicily. When it arrived, it was missing 2 of the hangers. There are 6 holes for the hangers--4 for the mainland and 2 for Sicily. I received only 4 of the hangers. I contacted Uncommon Goods and they requested 2 additional hangers. What I received was another map of Italy, minus the island of Sicily, and four hangers. Seems a waste to send all that when I didn't need it. A fun way to display travels as well as fave wines. They will showcase where they have traveled and the variety of wines they enjoyed in each state they visit.